An Illinois woman is seeking to trademark the dying last words of the New York City man who gasped “I can’t breathe” while being arrested by NYPD cops for selling loose cigarettes. In a December 13 application, Catherine Crump petitioned the United States Patent and Trademark Office to register the phrase for use on hoodies and t-shirts for men, women, boys, girls, and infants. The 57-year-old Crump, who lives in Waukegan, a city 40 miles north of Chicago, contends that she has been using “I can’t breathe” for commercial purposes since “at least as early” as August 18, one month after Eric Garner, 43, died following a confrontation with police on Staten Island. A video of the encounter captured Garner repeatedly saying, “I can’t breathe” as Officer Daniel Pantaleo wrapped his arm around the 350-pound suspect’s neck. Other officers sought to pin Garner to the sidewalk so he could be handcuffed. 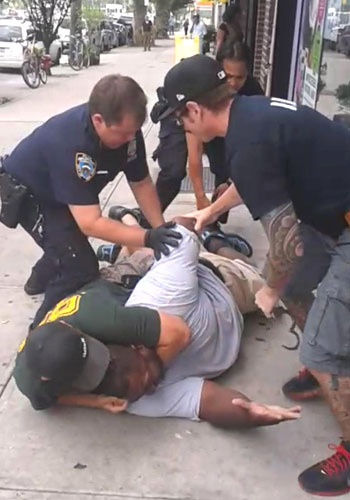 A Staten Island grand jury earlier this month declined to indict Pantaleo in connection with Garner’s death. During nationwide marches, participants have chanted “I can’t breathe” as part of protests against police brutality. In an interview, Crump said that she had “nothing to do with the Garner family,” and had not spoken to them about her trademark bid. While claiming that her purpose for marketing “I can’t breathe” garments was not to make money, she declined to disclose what other reason there was for her trademark filing (which cost $325). Three similar entrepreneurs have filed to trademark the phrase “Hands Up Don’t Shoot” for use on clothing items. Each of those USPTO applications was filed within three weeks of the August 9 death of Michael Brown, the unarmed teenager who was shot to death by a cop in Ferguson, Missouri.